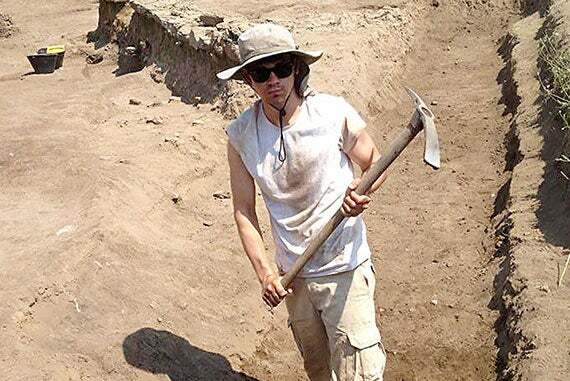 Harvard undergrad Matthew DeShaw learns by digging through a Roman historical site during a summer excavation program. In Area F (photo 1), the notable finds were shared with fellow “dig mates.” An overview of the Gabii site (photo 2) and Area D after a night of heavy rain (photo 3). The sun was barely high enough to light our way from the bus to the central area of the dig site. Even at 5:45 a.m., temperatures hovered in the mid-80s. The Italian heatwave did not dampen the excitement of uncovering history firsthand. Fresh off my freshman year at Harvard, and inspired by my study of Roman history with Kathleen Coleman, James Loeb Professor of the Classics, I ventured to Rome to join the Gabii Project, an archaeological dig at an ancient city that once stood near Rome. Following my passion for the ancient, I walked onto the vast site without preconceived notions of how history was actually uncovered. Textbooks rarely mention the lengthy hours, inferno-like temperatures, and careful work required to uncover, remove, examine, and catalog each finding. Finding history firsthand changed forever the way I view my studies. “I was assigned to Area D, an Iron Age settlement. The site itself contains the remains of numerous eras,” said Matthew DeShaw, pictured at the dig site. My long obsession with history prepared me for my studies at Harvard, and luckily, my study of history at Harvard mostly prepared me for my work at the dig site. I was assigned to Area D, an Iron Age settlement. The site itself contains the remains of numerous eras. Archaic Period stone walls define the rooms inside a wealthy family’s large house. Beneath the walls lie pits and postholes from Iron Age huts. The site is defined on one side by a 17th-century drainage channel, and on another by a first-century road. Within a relatively small area lie centuries of history. Armed with my trowel, I worked day after day carefully excavating. Work in Area D moved slowly because of the fragile stratigraphy. While the workers in Area C used shovels and wheelbarrows, we delicately scraped each layer with our trowels, looking for subtle differences in compaction, color, and composition of soil, indicating areas of archaeological relevance. My first finds were postholes, depressions that originally housed wooden poles for structural support of Iron Age Gabiian huts. The holes ranged in depth from a few inches to four feet. At one point, I excavated a massive posthole, 3 feet wide by 4 feet deep. This area yielded an assortment of pottery, charcoal, bone, and teeth. But most importantly, it taught me the painstaking processes at the center of historical discovery. By the end of the dig season in August, hundreds of uncovered postholes marked the site, defining huts built at different times during the Iron Age. What was not covered on the site was taught in evening lectures. Professors and lecturers helped us understand how work in each area fit into the bigger picture of the Gabii site’s history, and Gabii’s role in the wider scope of Roman history. Early on the final day of the dig, the rising sun again illuminated the path to Area D. But this day was different. Instead of seeing it as just another session, digging in 95-degree heat in long pants while caked in dirt, I saw it as a sort of graduation: from student of history to student historian. I had discovered how history was pieced together in the real world, one trowel scrape at a time, by mindful individuals in search of historical documentation. As I packed my bags and said goodbye to my dig mates, I looked forward to bringing my enthusiasm back to Harvard. My experience in Italy was as integral to my education as was my work in the classroom. Having the opportunity to visibly understand history enriched me. Becoming familiar with other cultures, both ancient and contemporary, helped nurture a better comprehension of my own. Ready to resume my studies of the past, ranging from Ancient Greek to American imperialism, I returned to campus with a greater respect for the academic subjects, as well as for the men and women who spend their lives excavating sites, studying the past and contributing to the historical record. Matthew DeShaw is a College sophomore. He will write an occasional column about his experiences as a member of Harvard’s Class of 2018. Brittain Ashford (left) and Gelsey Bell perform in Dave Malloy's supernatural off-Broadway musical "Ghost Quartet." This song cycle about love, death, and whiskey runs Sept. 9-12 at Oberon.